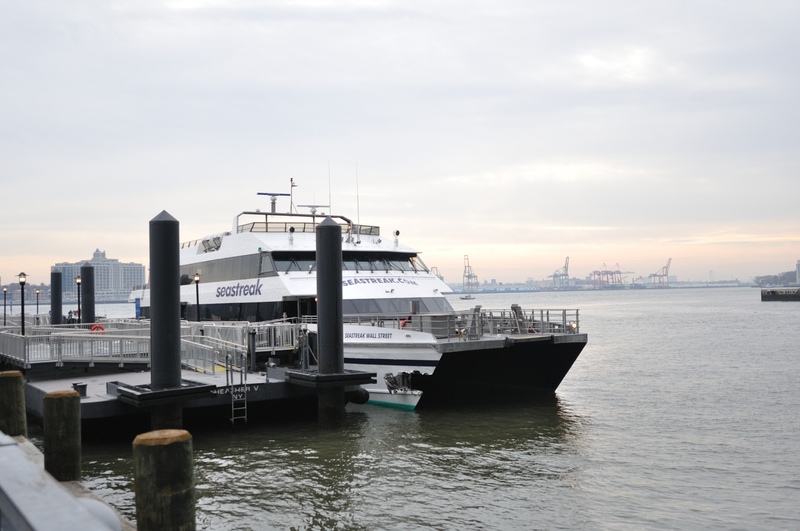 Yesterday the high speed ferry Seastreak Wall Street, on the 0800 run from Highlands NJ to Pier 11 Manhattan, allided with it’s berth during docking and suffered a large gash to the bow of the starboard hull. According to several sources I have read, 57 passengers were injured including two in critical condition. 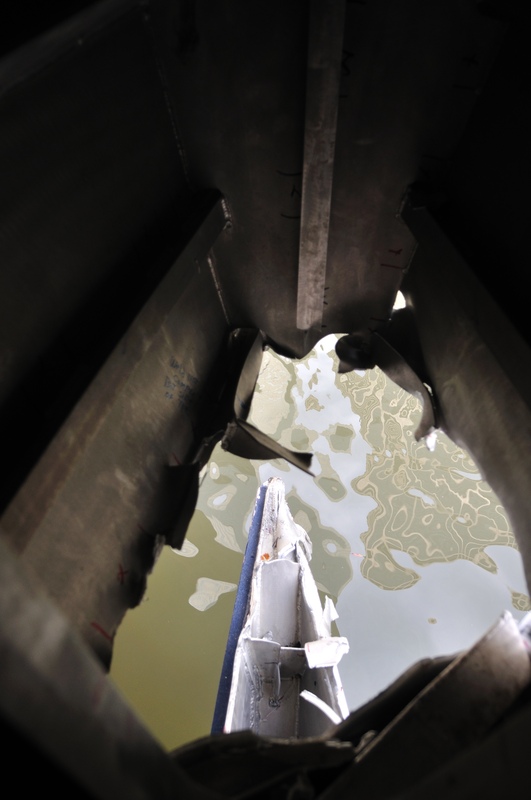 Currently the cause of the accident is unknown however several passengers remarked that the vessel appeared to be doing 10-12 knots at the time of the allision. In my mind the big thing that stands out with this incident is the statement by one passenger that, “everyone who was standing went flying”. For some ferry captains it is standard practice to make an announcement for passengers to stay seated until the vessel is docked, much like on an airplane as it approaches the gate. I wouldn’t be surprised to see a lot of ferry companies making this company policy in the coming weeks. The vessel was recently converted from water jets to CPP, and it is yet to be determined if a frozen pitch issue had anything to do with the incident. 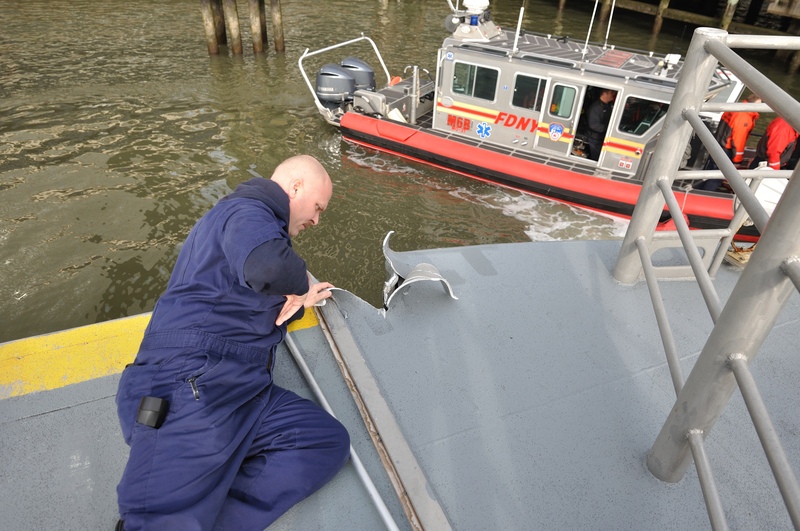 Pictures courtesy of the USCG. This entry was posted in marine incidents and tagged NYC ferry accident, Seastreak Wallstreet. Bookmark the permalink. That was the policy on the excursion boat that I ran; seems like a no-brainer. It is definitely a no brainier, enforcement of it is harder. However for a vessel that has to make the fast approach that the boats coming into pier 11 have to make (so I’ve been told), it would be something that definitely takes priority.